As I’ve mentioned before, main-dish salads aren’t one of Dave’s favorite things. He loves salads (on the side) and we’re both good about eating lots of veggies with our meal, but Dave definitely isn’t a “salad as a main dish” sort of guy. 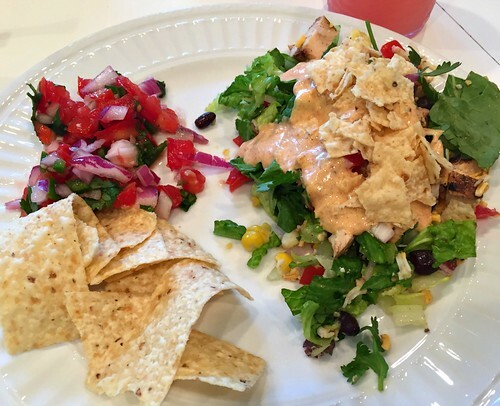 However, the man LOVES all Mexican foods — so when I served up this Fiesta Chicken Salad earlier this summer, I was not surprised when he had 3 full helpings. We actually had company over for dinner that night, and everyone kept going back to the salad for “just a little bit more” and then “just a little bit more” until the bowl was basically scraped clean. I’ve made this salad a few more times over the summer, and every time, I’ve been asked for the “recipe” — and it’s almost laughable, but there’s hardly a “recipe” to follow! I think the reason everyone seemed to enjoy this salad so much is because it’s more of a “stuff salad” than a more traditional “lettuce salad”. There is so much extra stuff and toppings that the lettuce is more of an afterthought. And the homemade dressing is fantastic! Definitely the perfect finishing touch to this simple salad. 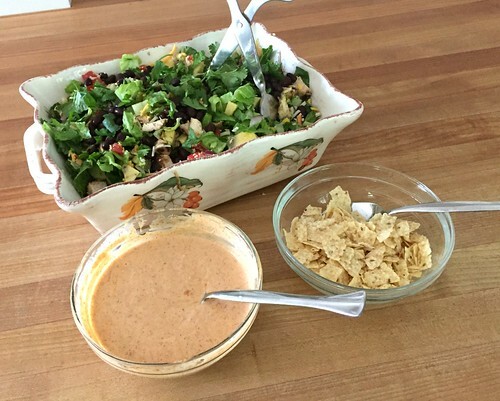 I serve this salad with extra tortilla chips and salsa — so simple! 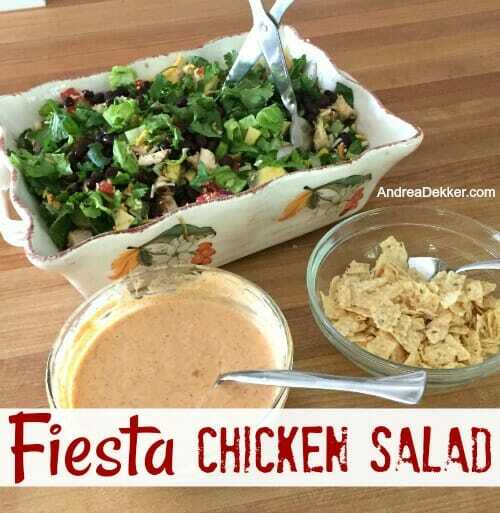 I know the summer is quickly winding down, but with fresh produce still readily available… there’s still time to enjoy those delicious farm-fresh veggies (and yummy grilled chicken) in this fantastic Fiesta Chicken Salad! 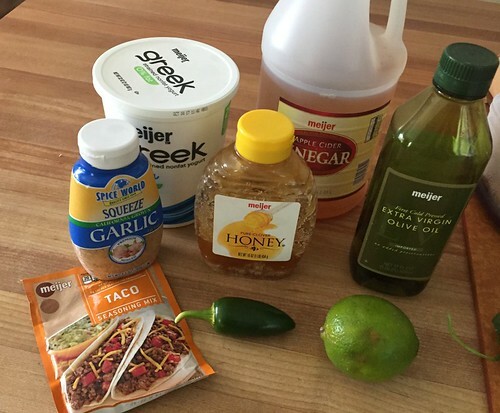 **If you don’t have the time or ingredients to make this homemade dressing, another REALLY tasty option is to simply mix already-prepared ranch dressing with taco seasoning and/or salsa. You can make it as mild or as spicy as you want! Also, you can make the dressing well in advance if you want — it’s amazing on other salads too! ** I just want to be super clear that this salad will most likely taste fabulous even if you make lots of substitutions — so please don’t shy away from making it just because you’re missing out on a few ingredients. Also, the measurements above are just suggestions — feel free to add less or more of any of the ingredients based on what you have on hand! pepper jack cheese would probably taste really good with this dish — or any type of Mexican shredded cheese blend. 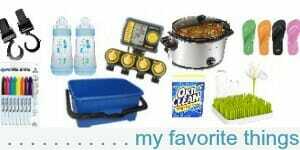 Just use what you have in the house and give it a try! In a medium bowl, combine all ingredients for the dressing, mix well and refrigerate until ready to eat. 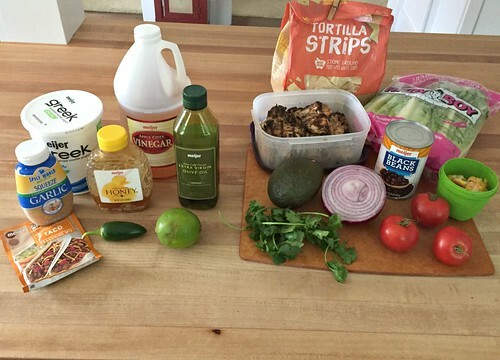 In a large bowl/platter/serving dish, layer lettuce and all toppings EXCEPT tortilla chips. Serve with dressing and crushed chips on the side. Obviously, all the flavors, textures, and colors in this dish make it a huge hit — not to mention all the “stuff” that is packed into this yummy main-dish salad. However, my favorite part is that it can easily be made ahead of time! I’ve even made it up to a full day ahead (adding the avocado in about an hour before). As long as you don’t put the chips or the dressing on, this salad stays super fresh for several hours — making it a great dish to bring to one of your end-of-summer BBQ’s or even a holiday party later this year! 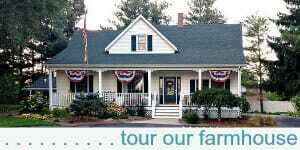 What are your favorite “stuff salads”? I finally made this salad last night and it was amazing! My daughter (who hates all things yogurt) loved it and my Meat and Potatoes husband had three helpings. Thanks for the yummy recipe! yay!! We actually have it on our menu for tomorrow — i can’t wait! It’s still one of my most favorite salads! Yum! Added this one to my meal plan. 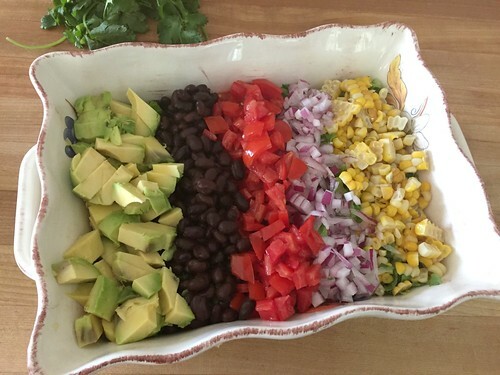 We often do a taco salad bar for family gatherings. This dressing would be a yummy addition. The dressing is AWESOME! Potentially a bit spicy for kids, but great for adults! yes, we love pepperjack cheese — even the kids! 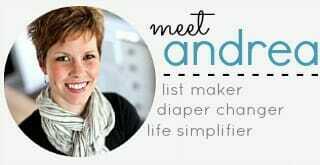 Hi Andrea, did you serve any other sides with this when you had guests? We just had the fresh salsa and chips — there’s a ton of stuff in the salad so everyone just had 2 helpings! We have a similar dish that we call burrito bowls. The ingredients are kept separate and added in layers with a cilantro/lime rice as the base. 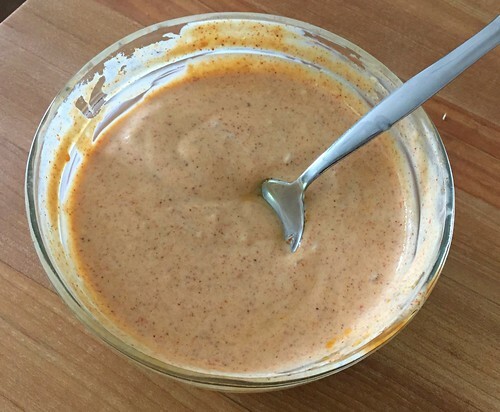 I have not seen a homemade dressing like this, but if you really want to be lazy you can use Hidden Valley Southwest Chipotle dressing. There are other brands out there with something similar, but it’s probably pretty close to your homemade recipe. I marinate my chicken using McCormick’s Mojito Lime seasoning packet with some oil and lime juice mixed in. Yum! Thanks for the tip about the dressing! I actually just made cilantro lime rice for a mexican dish a few weeks ago and it was SOOOOOOOO good! Not too overpowering, but just really tasty! This looks so good! A good salad for dinner never hurt anyone. And where is that baby girl???? I usually just marinate the chicken in Italian dressing — maybe with some Italian seasonings sprinkled on too. You could do more of a taco seasoning for this salad, but I usually grill up a bunch of chicken at one time and freeze it for later, so I don’t like too strong of a marinade. Oh yum! I can’t wait to give this one a try. One question: Did you grill/cook the corn (fresh of the cob) before adding it to the salad? our corn was grilled for the salad in the pictures — but only because we were grilling a bunch of corn for dinner one night and then I used a leftover cob for the salad in the pictures. I’ve definitely used canned corn with equally great results!